1 Creation is the sum of all God's Thoughts, in number infinite and everywhere without all limit. Only Love creates and only like Itself. There was no time when all that It created was not there. Nor will there be a time when anything that It created suffers any change. Forever and forever are God's Thoughts exactly as they were and as they are, unchanged through time and after time is done. 2 God's Thoughts are given all the power that Their own Creator has. For He would add to Love by its extension. Thus His Son shares in creation, and must therefore share in power to create. What God has willed be forever one will still be one when time is over and will not be changed throughout the course of time, remaining as it was before the thought of time began. 3 Creation is the opposite of all illusions, for Creation is the truth. Creation is the holy Son of God, for in Creation is His Will complete in every aspect, making every part container of the whole. Its oneness is forever guaranteed inviolate, forever held within His holy Will beyond all possibility of harm, of separation, imperfection, and of any spot upon its sinlessness. 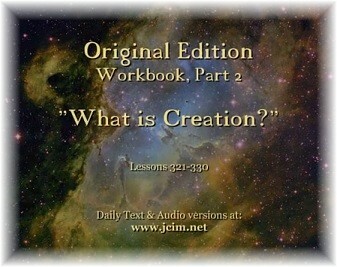 4 We are Creation---we the Sons of God. We seem to be discrete and unaware of our eternal unity with Him. Yet back of all our doubts, past all our fears, there still is certainty. For Love remains with all Its Thoughts, Its sureness being theirs. God's memory is in our holy minds, which know their oneness and their unity with their Creator. Let our function be only to let this memory return, only to let God's Will be done on earth, only to be restored to sanity, and to be but as God created us. 5 Our Father calls to us. We hear His Voice, and we forgive creation in the name of its Creator, Holiness Itself, Whose holiness His own creation shares; Whose holiness is still a part of us. 1 I did not understand what made me free nor what my freedom is nor where to look to find it. Father, I have searched in vain until I heard Your Voice directing me. Now I would guide myself no more. For I have neither made nor understood the way to find my freedom. But I trust in You. You Who endowed me with my freedom as Your holy Son will not be lost to me. Your Voice directs me. And the way to You is opening and clear to me at last. Father, my freedom is in You alone. Father, it is my will that I return. 2 Today we answer for the world, which will be freed along with us. How glad are we to find our freedom through the certain way our Father has established. And how sure is all the world's salvation when we learn our freedom can be found in God alone. When Jesus says, "Creation is the sum of all God's Thoughts, in number infinite, and everywhere without all limit," (W.PII.Q11.What is Creation.1.1) he is making clear that God created One Son and affirms once again that Creation is perfect Oneness. Why does he speak of infinite numbers and then say, "We are creation; we the Sons of God. We seem to be discrete, and unaware of our eternal unity with Him" ? (W.PII.Q11.4.1-2) This is how we currently see ourselves. While the truth is that there is only One Son, our distorted view of reality is that we are separate and discrete, but this is only because we are unaware of our eternal unity. While in truth the separation never happened, in our experience it seems that it has. It seems to us that these bodies and the world of time and space are reality. The Oneness Jesus speaks of may seem without real meaning and more like an illusion until we have an experience of it. Jesus acknowledges this when he says, "All this takes note of time and place as if they were discrete, for while you think that part of you is separate, the concept of a oneness joined as one is meaningless." (T.25.I.7.1) (ACIM OE T.25.II.10) In actuality, the separation never happened. Jesus speaks of the separation as something that seems to have happened, as he meets us where we think we are. Yet, he reminds us that in reality it was "so very long ago, for such a tiny interval of time, that not one note in Heaven's song was missed." (T.26.V.5.4) (ACIM OE T.26.VI.34) In essence, nothing happened. Our reality as God's Son means that we have all the attributes of our Creator. Jesus says, "God's Thoughts are given all the power that their own Creator has." (W.PII.Q11.2.1) We are the Thoughts in the mind of God. As such, we all share in that power, and we all share in God's attributes. We are eternal, unlimited, invulnerable, perfect, and powerful beings of love and light. Our part is to "Let our function be only to let this memory return, only to let God's Will be done on earth, only to be restored to sanity, and to be but as God created us." (W.PII.Q11.4.6) There is only this function for us and none other. This is what time is for. We have no other function but to join in purpose with our brothers, recognizing that we are not different. We share the same purpose, which is to awaken from the insanity of this world to a state of perfect sanity. We can only know the truth when we give up judgments, comparisons, and attacks on our brothers. When we attack, we see them as unholy and different from us. We project the guilt in our own minds onto them so we can feel innocent. When our purpose is to awaken, we willingly take responsibility for our projections and place them onto the inner altar. We recognize that we are all the same reflection of Oneness. When we know that we are innocent, we see innocence in all our brothers, regardless of their behavior. Innocence is their true nature, just as it is our own. Our brothers may be listening to the ego and may not yet have recognized that they have another choice, but they still share what has been given by God to every brother. His love is indifferent. It shines on everyone. The Call is strong in all of us, although we can resist it, tune into the ego channel, and blot out this Call. The Lesson today, "Father, my freedom is in You alone," (W.321) challenges our view that freedom lies with the ego. From the perspective of the ego mind, freedom means that I do as I please. It is to be free of any responsibilities, demands, or requirements. We want the freedom to do whatever we want, to indulge our wants and our desires, to come and go as we please, and to judge and attack whenever we choose. We believe freedom is about exercising our own will separate from the Will of God. The separated self is the rebel that resists healing. We demand our space. We insist on our independence. We compete against everyone, including God. This is the authority problem. But we think this is freedom. We are trapped in our reactions where there is an appearance of choice but, in fact, there is no choice. We focus on independence and control because we believe it is the way to protect ourselves from pain, fear, unworthiness, and sacrifice. We fight to do it our way, as per the lyrics in Frank Sinatra song. We celebrate this kind of independence, yet it is the root of all of our problems! It seems to us that to surrender to the Will of God is to end freedom as we have defined it. However, what we call freedom, Jesus calls imprisonment of our true will. He says, "When you have learned that your will is God's, you could no more will to be without Him than He could will to be without you. This is freedom and this is joy." (T.8.II.6.4-5) (ACIM OE T.8.III.13) Identification with the ego limits us and keeps us in a state of uncertainty and unaware of what we truly want that is deep within our hearts. The Lesson says, "Father, I have searched in vain. . ." (W.321.1.2) which was certainly my experience for many years. I was always driven by the question, "Who am I really?" I looked for answers in books, workshops, and relationships. I was always searching for happiness, but it always eluded me. Underneath my search was fear and anxiety. My experience was one of searching in vain "until I heard Your Voice directing me." (W.321.1.2) It was not as if I actually heard a voice, but I knew I had found the answer when the Course came into my life. It was no accident. It was beautifully orchestrated. We meet who we need to meet, and we get what we need, whether we are open to it or not, until we are ready to receive the only Answer. Our willingness keeps moving us forward with each step we take to true freedom. As we apply the Lessons and see them contribute to more peace, joy, and a sense of spaciousness in our lives, our motivation increases. If we truly want happiness and true freedom, Jesus says that there is only one way---through the healing of our minds. We know how simple salvation's formula is, yet all of us experience how difficult the process can be, but it need not be. We can choose peace. Jesus says, "When your mood tells you that you have chosen wrongly, and this is so whenever you are not joyous, then know this need not be ." (T.4.IV.2.2) (ACIM OE T.4.V.57) The key is willingness. We can always make another choice. Do you notice how motivated you are to do this work when you are at the end of your rope? I know for me, I turn to God more often when I am under siege than when everything is going "swimmingly" in the world according to what I think I need. That is why we can be grateful for "opportunities" that invite us to really dive into this work. Oh, yes, we may resist these "opportunities" and get angry and distressed about things going "wrong" in our lives as we perceive them, but if we recognize their contribution to our awakening, we can become happy learners, even in the midst of difficulties. There is nothing to regret. Just as in the movie, About Time , we learn that it is not helpful to live by hypotheticals. When we do, we lament what should have happened and could have happened and don’t embrace the present moment. William Shakespeare writes in the play, As You Like It , "Sweet are the uses of adversity." Adversity in our lives is not sweet to the ego. When events that cause us distress come along and our lives are disrupted by sickness, abandonment, loss, and lack, we see nothing sweet in it. But when we argue with what shows up, we suffer. When everything is used for the purpose of healing and transcendence, it all serves a mighty purpose. Everything that seemed to be certain in our lives might be taken away. It can be a dramatic, disorienting, and even frightening time. Our normal impulse is to try to find our way back to feeling secure again as quickly as possible and to regain control. These times of crisis can, however, serve a mighty purpose. When we are dedicated to healing, we don’t resist the opportunity that is there in the seeming adversity. We recognize and even welcome the gift that is available with any seeming setback. In the movie, About Time , there is a wedding scene where the winds blow, the tent is taken down, the wedding cake is soaked in the rain, and yet the characters enjoy the experience of joining in the sacredness of their relationship. I recognize that my need for order would react differently to such an experience, yet my goal is to experience peace regardless of what is going on around me and even find delight in the midst of seeming disaster as these characters demonstrated. Yes, it is challenging, but there is no gift we can attain that is greater than to experience consistent peace and joy. We may think we want things to be different, yet everything is perfect for our awakening. All that is required is that we become the witness to what is happening around us. In other words, we recognize that we are the dreamer and not the character in the dream. When we can see this, even the worst things, as we define them, that seem to be happening in our lives can become the doorway into transcendence. Each moment is simply what it is. Once we argue with it, we suffer. Our arguments are the ego's demands that it be not what it is. He should not watch so much TV. He should help me with the dishes. Acceptance is about releasing such demands. It may not be pleasant on the physical level, or for our psyches, but there is pain when we resist the experience. Suffering only comes with resistance. We live under the guidance and control of the ego until we decide, "Now I would guide myself no more." (W.321.1.3) We will try to be the managers and controllers of our lives by judging events as good or bad, or by what we like or don't like, until we realize that this is where suffering comes from. No matter how much we try and how many roads we travel, our goal to be happy simply cannot be met with the ego as guide. The first step is to recognize that no matter how hard we try to control outcomes, and no matter how hard we try to find happiness in the world, we will always fail. Yes, there will always be moments of pleasure, but they will not last. That is why there is always a degree of fear with all our happy, pleasurable times. We know that they will end. With this recognition comes more willingness to surrender and thus more willingness to admit that we have been wrong and to find a better way. The "gift" of ego weariness is that it motivates us to move forward in applying these teachings. Jesus asks us to trust him on behalf of our freedom and happiness. On my own, "I have neither made nor understood the way to find my freedom." (W.321.1.4) We must put ourselves in God's Hands. We must learn to make all decisions with the Holy Spirit and not on our own. Trust is the first and most important characteristic of the Teacher of God. We have an authority problem. We don't want anyone to direct us, yet only under His direction, when we surrender to His Will, will we know true freedom. "Your Voice directs me, and the way to You is opening and clear to me at last." (W.321.1.7) Freedom comes with willingness and surrender and with the acknowledgment that we don't know. When we recognize that our way has imprisoned us, we will deeply desire to know our true will. Devotion to our practice is the way to realize this desire. Lesson 131 reminds us, "Heaven remains your one alternative to this strange world you made and all its ways; its shifting patterns and uncertain goals, its painful pleasures and its tragic joys. " (W.131.7.1) (ACIM OE W.131.8) All pleasure we pursue in the world brings pain and all we describe as joy results in tragedy. The reason pain and pleasure are the same is that they share the same purpose. And what is that purpose? The purpose is to make the body-identity real in our experience. Pain and pleasure both compel our attention and both distract us from hearing the Holy Spirit's guidance. Are we ready to accept that there is no freedom or happiness apart from Him? When we pursue pleasure, we make the body the center of attention, which keeps us distracted from what would truly bring peace and freedom. I recently experienced an event that felt like a sacrifice. We had planned to be with friends at a concert, but a call came from someone asking for help. The guidance was to respond to the call, but it meant giving up the concert and responding instead to the call for help. I was prompted to give up my idea of "pleasure" and offer support and to be of service instead. Even though there was some initial resistance, the fulfillment and joy that came from responding to this call with openness and receptivity, was truly nourishing. I was being used to fulfill my purpose to help a brother and it felt liberating and joyful. That is what true freedom is---a deep level of satisfaction found in nothing I pursue on my own. You may still find, as I do, that you are pulled between your interests as you define them and guidance. You may still find that you are reluctant to follow His guidance, or for that matter, to even ask for it. Our fear is still that we think God's way will somehow limit our personal interests. Our fear is still of Love, because our demand is always, "I want it thus !" When we acknowledge that our way is not working, we open to the Holy Spirit more and more. We pray the prayer today with the intent of recognizing that we don't understand what freedom is or even where to look to find it. We acknowledge that we have spent our lives searching in vain until we have responded to the Call in us. "Today we answer for the world, which will be freed along with us," (W.321.2.1) because the world is nothing more than the projection of our thoughts.